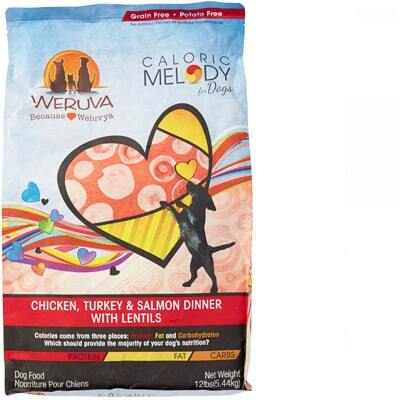 Weruva Caloric Melody is a mid-priced dog food with exceptional quality. This product has no controversial ingredients, including zero artificial preservatives, colors and flavors. It has well-balanced amounts of protein, fat and carbs, with an excellent quality of meat and fat. Weruva has a below average number of recalls, and the company was relatively transparent when answering our questions. Watchdog Labs highly recommends this product. The average dog food we reviewed has 39 total ingredients, with 1 controversial ingredient. This food does have a grand total of 0 controversial ingredients, excellent! Lenils are a legume that provide carbs, fiber, protein and numerous nutrients like folate, vitamin B6, phosphorus, iron and zinc. The U.S. Food and Drug Administration (FDA) has warned that there is a potential link between lentils and canine heart disease. It is still too early to draw conclusions so we cannot yet say if potatoes are a generally high-quality dog food ingredient or should be avoided. Split peas are peas that are dried and crackd in half. Peas are a good source of carbs, fiber and protein. Peas are starchy but high in vitamin A, vitamin B6, vitamin C, vitamin K, phosphorus, magnesium, copper, iron, and zinc. We consider this a healthy dog food ingredient. The U.S. Food and Drug Administration (FDA) has warned that there is a potential link between peas and canine heart disease. It is still too early to draw conclusions so we cannot yet say if peas are a generally high-quality dog food ingredient or should be avoided. Weruva Caloric Melody Chicken, Turkey & Salmon Dinner with Lentils doesn’t have any controversial ingredients. This food is made in Canada. That’s good, because similarly to the United States, Canada has strong quality and food safety laws in place for dog food. De-Boned Chicken, Turkey Meal, Salmon Meal, De-Boned Turkey, De-Boned Salmon, and Chicken Cartilage are the main meat and animal ingredients in this food. All of them clearly label which animal they come from. The same applies to the added fats, Chicken Fat and Salmon Oil. This is great as it makes the ingredient quality more transparent. Weruva Caloric Melody Chicken, Turkey & Salmon Dinner contains no controversial preservatives. It’s good to know that ‍not all artificial preservatives are bad. That’s because they serve an important purpose, which is to prevent food from spoiling. However, we consider 11 artificial preservatives controversial because of their potential link to cancer and other serious health conditions. Weruva has a below average number of recalls. Weruva responded in 2 days to the first email. The answers were incomplete and several follow-up emails were required for clarity. In the end, some questions remained unanswered. We use nutritionists and veterinarians on a consulting basis, with high credentials to help formulate our food. All of our formulas are designed to meet AAFCO standards and the Weruva family pets are used as our taste testers. We use both nutritionists and veterinarians on a consulting basis to help formulate products and address any necessary concerns. Our consultant is a leading and respected nutritionist who has served on several regulatory boards. As we do not regularly formulate items (sometimes once a year or less), we do not have one on staff. ‍This is helpful information, but it would be much better to know who is the specific professional that has worked on the food. As you know, AAFCO sets forth the nutrient requirements in foods in order to deem them complete and balanced. Nutritionists may want to tilt the nutrients here and there in a formula, but by and large, the AAFCO nutrient profile serves as guidance. From a manufacturing/production standpoint, expertise is of course necessary because many nutrients will degrade during the processing of the food. And this is often particular to the manufacturer. In designing formulas, often, veterinarians/nutritionists note that AAFCO recommended vitamins and minerals are needed, but the inclusion amounts typically rests on manufacturers as they must tweak the quantities of each to ensure proper amounts post-production. The food – In some of our formulas, the food ingredients may be limited to chicken breast, potato starch and sunflower oil. The starch is not used for nutritional purposes-- it is for thickening the gravy and for providing texture. It is about 1% of the formula. The sunflower oil is less than 1%, and it is added to bring in some omega-6 to the formula at a particular level. The chicken inclusion is, of course, to bring in a target amount of protein and fat. Based upon the nutrients in the food, the premix may be adjusted. So, by and large, we have an established premix process to ensure formulas are complete and balanced from a vitamin/mineral standpoint, and the total food ingredients are typically limited to a few consistently sourced food ingredients. Though there are a lot of complexities “behind the scenes” to get this right, one could look at this and say it is a pretty “simple” process. All of our foods are formulated with the obligate carnivore in mind to meet the requirements of AAFCO in order to make our foods complete and balanced. No, we do not run the AAFCO feeding trials. That first response was long and included lots of great information, but did not directly answer the question. The follow-up response they sent was short and to the point. Our wet products (pouches and cans) are manufactured in Thailand in facilities that also make food for people-much of the food for people goes to the US and countries with the strictest processing standards, such as those in the EU, Australia and Japan. Thailand is a world leader in producing foods for people around the globe, and much of the world's tuna fish supply for people comes from Thailand (Thailand is also a top chicken producer for people). As exports are the driving force behind the Thai economy, there are strict governmental regulations in place to ensure the safe handling of food for people and pets. In addition, the processing standards from both the supply and production side must meet strict international standards. Our management team visits the facility multiple times a year. All of our cat food is made in Thailand, we do not produce any products in the US and, tours of our manufacturing facility are not available at this time. The process entails quality control standards that include keeping the factory in a condition where it can pass multiple annual inspections performed by international entities and third-party auditors, each under strict scrutiny. Such inspections ensure that we abide by Good Manufacturing Practices (GMP) regulations and Hazard Analysis and Critical Control Points (HACCP) systems, meeting the demands of the global market. Perhaps the strictest human processing standard is called the British Retail Consortium (BRC). A grade of "A" on the BRC standard is regularly earned. Additional information was not provided. Knowing who is actually manufacturing the product is a very big part of being transparent. Never like to see this question unanswered. As far as China, on occasion we source tricalcium phosphate from China however, we are currently looking for new suppliers outside of China.